Increasing threats, violence and excessive working hours are leading to serious distress, burnout and depression among principals, an annual survey of the nation’s school leaders shows. 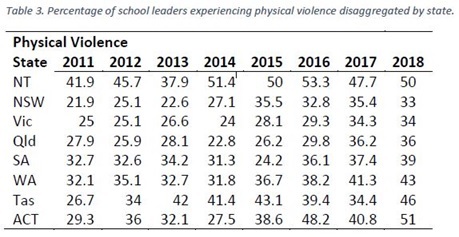 The Australian Principal Occupational Health, Safety and Wellbeing Survey – which collected data from about 50% of Australia’s 10,000 principals – found almost half (45%) were threatened with violence in 2018, compared with 38% in 2011. Female school leaders are most at risk of physical violence with 40% experiencing violence compared to 32% of male school leaders. The rates of physical violence show a concerning upwards trend in almost every part of Australia including: NSW, Victoria, Queensland, South Australia, Western Australia, and the ACT. The report also revealed that during school term, 53% of principals work 56 hours per week (more than 20 hours above the national average) and that 24% of principals worked more than 61-65 hours per week. In total, an overwhelming 99.7% of principals worked hours far beyond those recommended for positive mental and physical health. Associate Professor Philip Riley, from Australian Catholic University’s Institute of Positive Psychology and Education and the survey’s chief investigator, said Australia should adopt “a whole of government approach to education”. “This would mean the federal government, states and territories combine to oversee a single education budget. The funding agreement should be bipartisan and a transparent mechanism which is simple to understand,” Riley said. 53% of principals worked more than 56 hours per/wk, during term. 24% of principals worked more than 61-65 hours per/wk. 99.7% of principals worked hours far beyond those recommended for positive mental and physical health. The survey found the sheer quantity of work and the lack of time to focus on teaching and learning were the greatest sources of principals’ stress. Teacher shortages were also a frequent issue. An increasing source of stress is managing the mental health issues of staff and of students. Association of Heads of Independent Schools of Australia (AHISA) CEO, Beth Blackwood, said the work of a principal has been described as “the best job in the world, with some of the worst days imaginable”. “The Survey results reveal that principals work longer hours and suffer far higher levels of work-related stress than the general population,” said Blackwood, who was a member of the Survey’s consultative committee. Blackwood added that the Survey results send a strong warning that when employers or parents trade on principals’ aspirations for their schools and students they are putting principals’ health and wellbeing at severe risk. “The results can therefore be interpreted as a barometer of the health and wellbeing of our nation as a civil society, and the indicators are there for all to see: for the sake of all those who work and learn in our schools, Australia must do better,” she said.